So you've installed Solr 1.4 and you've managed to get some data indexed. Now you're ready to have some fun with faceting. Faceting is basically just filtering the results of a search without effecting the relevance score. 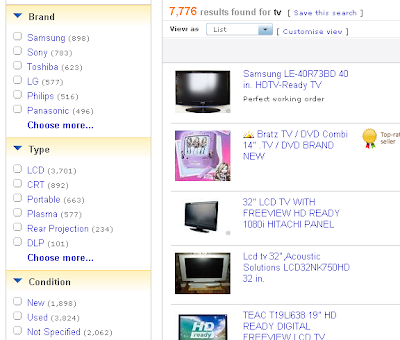 Sites such as ebay use faceting to help narrow down the results of a generic search like TV, to give you options such as 32" wide-screen LCD etc. It makes for a very pleasant user experience. It's one of the main reasons to use Solr and Solr makes this process very easy. There are actually 3 types of faceting. In this post I'm only going to talk about "field faceting". Once you've mastered "field faceting", the other 2 types ("query faceting" and "date faceting") are very easy and the basic Solr Wiki will be enough for you to get going. Now when you're indexing data in Solr, it's best to use the "text" field type, as this applies lots of filters which will help sort out plurals, remove white space etc. However when it comes to faceting, the values returned will be the values after the filters have been applied. Therefore it's best to create new versions of any fields you wish to facet. I was looking around for some information on how best to add the AssemblyVersion to an MVC site. In the end I thought I'd do it my self as it can't be too difficult. It wasn't and I've included how to do it in this post to help other people out. The first thing to do is add a Helper class to your existing project. I decided not to use a namespace so I didn't have to import the namespace into the View. I've been using Blogger as my blogging engine for a couple of weeks. I've been quite impressed at how easy it makes it to update your blogs look and feel and how free you are with the HTML and semantic layout of the pages. One thing that seemed to be missing was allowing developers to copy and paste code into their blogs and allow other users to copy and paste the code from the blog into their own code. So in my search to find something better i came across this post which uses syntax highlighter.